Writer’s block: Spider has nothing to say. It has been pointed out to me, by one good man who reads well, that it is surprising that I, a journalist who writes a column on comics, should continue to ignore the most famous journalist to populate a comic book. I know you like Menecken, Wolfe and Thompson, this person told your favourite columnist (am not? then you’re on the wrong page), so why has Spider Jerusalem never made an appearance in the column? Jerusalem, for those of you who don’t recognize the names, is where the Wailing Wall is and, as I told you good people once, you are on the wrong page. 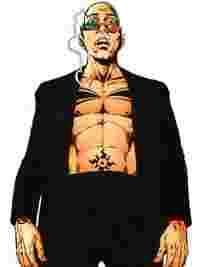 Spider Jerusalem is a bald skinny man with an abundance of tattoos on his body, who loves shooting and shooting up (a bouquet of exotic drugs including Queen Ant extract, whatever that may be), and who lives in the foreseeable future. A misanthrope at heart (if he has one), Jerusalem takes on the political establishment, including a president or two, through his writings, which are high on invective and feeling and low on fact. In one story, he submits an 8,000-word article featuring one word—f***. While Spider’s own writing is boringly scatalogical at worst and rabidly poetic at best, Ellis’ is sharp, witty, and pithy. That made Transmetropolitan (illustrated largely by the talented Darick Robertson) a cult comic book (it began in 1997 and ended five years later in 2002). While some of the later books (all the books are collected in 10 trade paperbacks) may show what seems like unseemly haste, the plot itself (good journalist against bad politician) is purely incidental. What isn’t is Messrs Ellis and Robertson’s vision of the future—media-rich, druggy, dark, violent (what serious book reviewers would call post cyber or post punk, or, even better, post cyberpunk). So, to return to the original question, why did readers have to wait so long to get to know Spider Jerusalem? Maybe this writer was, to use a cliche, saving the best for last (actually, not really last because there are, by my count, at least two more CFs to go). Maybe he didn’t want to share a good thing. Maybe he thought no one would really get Spider or Ellis. After all, few people get Thompson. Or maybe it was because Spider wanted to be left alone. Surely, even the attention of the fraction of this country’s billion population that reads this paper (I call this group the smart set) would be too much for a man who doesn’t really like to be in the public eye?